I got the Momofuku cookbook for my birthday! 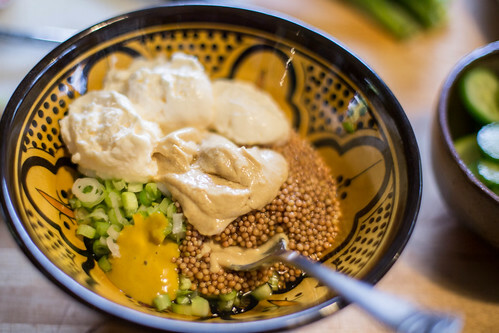 To break it in, we had some friends over to dinner and I made a bunch of things out of it: pork belly ssäm, pickled mustard seed sauce with pickled cucumbers (recipe below), sweet corn with miso butter, and steamed buns. 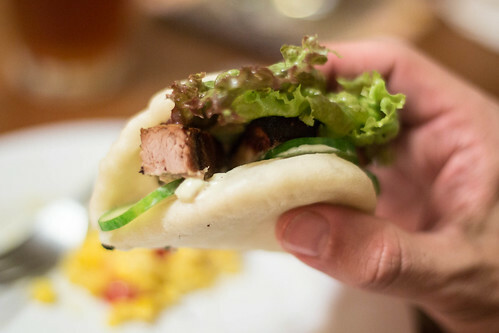 Well, the buns were my own favorite bao recipe, but I shaped them based on David Chang’s process, folded over into little pockets before steaming, and it worked great. The sauce was killer. The salty-sweet roasted pork belly wasn’t bad either. There were very few leftovers. I really like these. Sharp and mustardy but not as strong as you might think, and they pop like okra seeds in the mouth. Combine in a saucepan, simmer gently for 45 minutes until the seeds plump up. 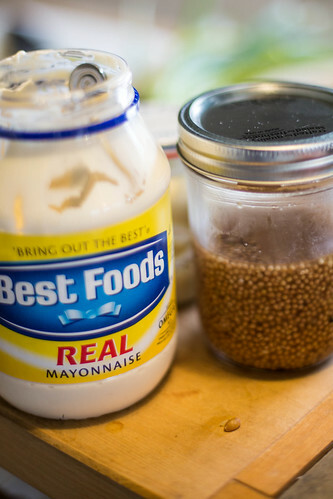 Pour into a clean jar and refrigerate. This was amazing smeared all over the pork buns, but it would be equally great on hot dogs or ham sandwiches. Combine everything in a bowl and mix well. Eat.